Silver Dollar City theme park in Branson is a great place to have fun with the whole family as it offers lots of exciting attractions, entertainment shows, and a wide variety of thrilling rides. As you enter the gates of the 1800s-style theme park, you will feel as if you have been transported back in time. 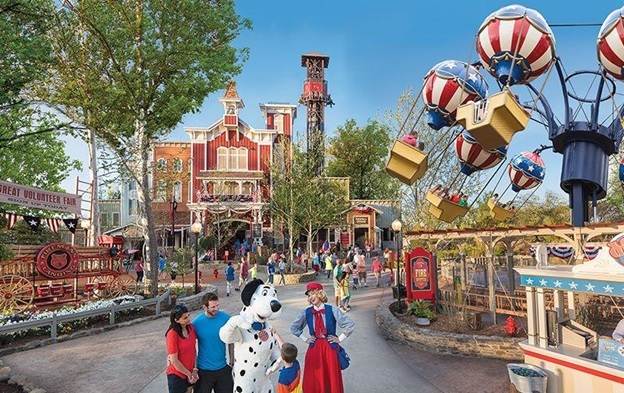 Silver Dollar City is home to six annual festivals and features 30 thrilling rides, 40 entertaining shows, and 60 outlet shops and restaurants which make the place a fascinating vacation destination for every family. This beautiful theme park was rated as the best theme park in the USA by the Amusement Today magazine. In this beautiful theme park, you will have an opportunity to buy unique craft items at quaint shops where many of the craftsmen and artisans make and sell unique crafts and other hard-to-find items. In the park, you will get to enjoy various shows such as the Saloon Show or the Great American Country Nights in Echo Hollow. At the park, you can have the chance to see craftsmen such as glassblowers, weavers, potters, knife smith, quilters, blacksmiths demonstrating their skills in front of you. Family with accompanying children should not miss to visit the Half Dollar Holler, a place where younger visitors can venture up the climbing nets, ride the carousel, play in the sand tables, or explore the treetop fun houses. The place also features a storytelling stage where actors in 1800s costume relate tales that are sure to give young ones educational experience. At the park, you will also get the chance to explore Marvel Cave, which is included in your admission ticket. This cave was leased by a nature-loving Chicago family to make it as a summer cave tour business. But it was developed as a theme park attracting over two million visitors each year and winning the theme park industry’s top award of excellence worldwide. Over the years, the theme park has continued to expand. With over 100 acres, Silver Dollar City continues to focus on American heritage with craftsmen such as woodcarvers, glassblowers, basket makers, leather crafters, potters, candle makers, knife makers, quilters, and many more. Silver Dollar City today offers more adventurous guests rides that range from an amazing wood roller coaster to rides for the kids and amazing production shows that are beautifully themed to keep the old-fashioned look. The park gained worldwide recognition when it received the 1999-2000 Applause Award, the theme park’s industry’s top award of excellence based on operations, management, creativity, and ingenuity. The park was also a recipient of the prestigious Thea Classic Award in 2001, recognizing worldwide excellence and outstanding achievement in the themed entertainment from the Themed Entertainment Association. It was also awarded as being the “Friendliest Park” in the entire theme park industry in 2009 by the Golden Ticket. So, if you want to experience non-stop fun of exciting activities and thrilling rides, bring the whole family to Silver Dollar City in Branson.